Drilling at Jaxon’s Hazelton Silver-Zinc Project Supports Mineralized VMS Model, Samples at Lab | Jaxon Mining Inc.
Jaxon Mining Inc. (TSXV: JAX, FSE: OU31, OTC: JXMNF) is pleased to provide an update from the Fall/Winter 2017 drilling program at its 44,000-hectare Hazelton silver-zinc project, located 50 kilometres north of Smithers, in the Skeena Arch of British Columbia. Eight out of fourteen drill holes are completed, totaling 1,344 metres out of a planned 2,000 metres, and the ninth hole is underway. Four pallets of core samples have been shipped to MS Analytical Laboratories in Langley and Jaxon is awaiting assay results. Multiple phases of mineralization have been observed, which is suggestive of a potentially large and long-lived system. The Phase 1, 2,000-metre drilling program is taking place on the Max Target, on the north-eastern slope of Blunt Mountain. The program is targeting volcanogenic massive sulphide (VMS) occurrences, high chargeability and low resistivity (high conductivity) anomalies from the recently completed 2D and 3D IP survey coincident with highly mineralized channel, and soil assays. Many of the targets are a combination of these targeting parameters. Data from a helicopter borne electromagnetic survey (VTEM) was also useful in drill target selection. Preliminary observations of drill core provide strong evidence for a shallow marine VMS depositional environment. The notable features include intercalated rhyolitic and monzonitic volcanics with well-preserved volcanic tuffs intercalated with argillite and altered greywacke beds. The nature of the sequences in the core generally indicates an active geological environment. 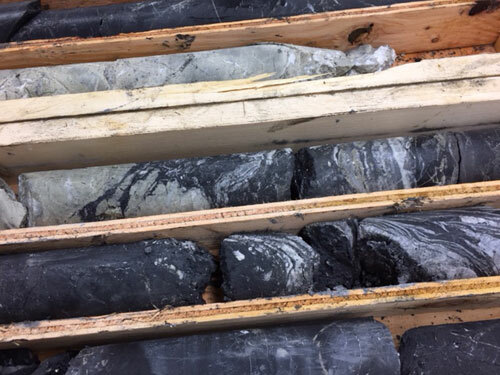 Sulphide mineralization has been intersected in each hole drilled. To date, ground conditions for drilling are excellent with all holes reaching their projected depth. All core samples are transported daily to Jaxon's secure core logging/cutting facility in Smithers. After logging, the selected sections are cut in half with one half placed back in the core box, and the other half prepared for shipment to the assay lab. The sample is placed in numbered plastic sample bags along with a sample number tag and immediately sealed. Samples are packed in rice sacks, sealed, and palettized. The pallets are delivered to Bandstra Transportation Systems Ltd. in Smithers to be shipped to MS Analytical in Langley, B.C., for analysis. MS Analytical is ISO/IEC 17025:2005 certified, and has its own in-house QA/QC program utilizing blanks, duplicates and standards. Jaxon is conducting its own independent QA/QC program for the drill program which includes the insertion of certified standards, blanks and limited duplicate samples. These samples are checked to ensure results fall within acceptable target ranges. 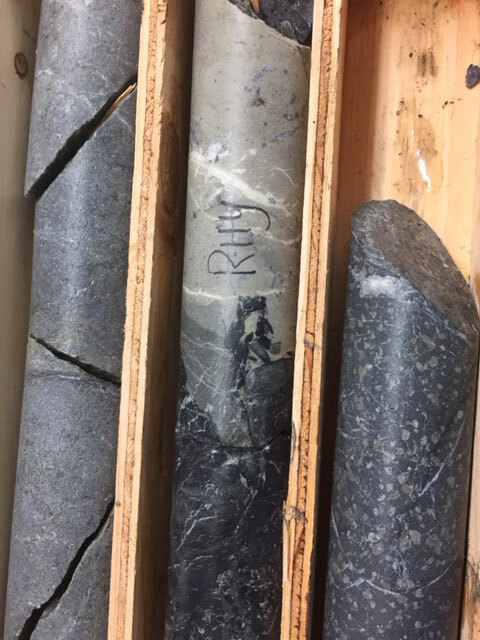 It should be noted that turn-around times for assays are currently unusually long due to an increase in exploration activity in British Columbia. Jaxon has a policy of not reporting visual estimates of mineralization as such estimates cannot be relied upon with the same confidence as assay results. A drill plan view map and selected core sample photos are included in this news release. 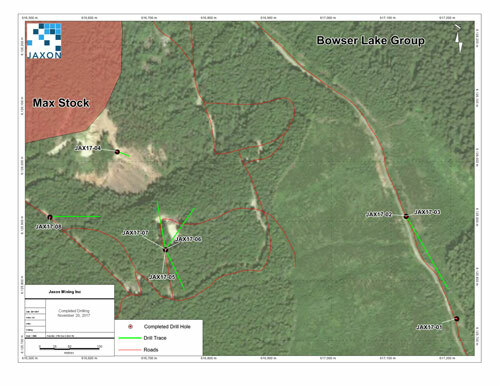 Additional material including drill site photos is available on the company's website at www.jaxonmining.com. Jaxon Drill Hole Map, Max Target, Hazelton Project. Complex contact between rhyolite (pale green-grey) and argillite. The contact relationships suggest either extrusion or intrusion of the rhyolite into still unconsolidated sediments. Contact between rhyolite (green-grey)and argillite (black) grading into wacke (top compartment). The lower compartment shows porphyritic monzonite. This rapid variation of intrusive and sedimentary rocks is supportive of a very active sub-marine environment. For further information regarding Jaxon Mining Inc., please contact Mark Carruthers at 604-608-0400. This news release may contain forward-looking information, which is not comprised of historical facts. Forward-looking information involves risks, uncertainties and other factors that could cause actual events, results, performance, prospects and opportunities to differ materially from those expressed or implied by such forward-looking information. Forward-looking information in this news release may include, but is not limited to, the Company's objectives, goals or future plans. Factors that could cause actual results to differ materially from such forward-looking information include, but are not limited to, those risks set out in the Company's public documents filed on SEDAR. Although the Company believes that the assumptions and factors used in preparing the forward-looking information in this news release are reasonable, undue reliance should not be placed on such information, which only applies as of the date of this news release, and no assurance can be given that such events will occur in the disclosed time frames, or at all. The Company disclaims any intention or obligation to update or revise any forward-looking information, whether as a result of new information, future events or otherwise, other than as required by law. Neither TSX Venture exchange nor its Regulations Services Provider (as that term is defined in the policies of the TSX Venture Exchange accepts responsibility for the adequacy or accuracy of this release.